Moses Ogbu opened his account for the season in IK Sirius's 2-0 road win over Norrkoping in the Swedish Allsvenskan on Monday at Ostgotaporten in front of 7,083 spectators. On 70 minutes, Ogbu slipped through the defense to break the deadlock after meeting a teammate's cross from the left side of the box. In the fifth minute of stoppage time, Christer Gustafsson finished off a counterattack, with Ogbu providing the assist after missing a free-kick. 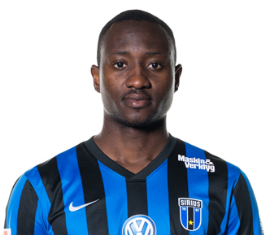 The 26-year-old Nigerian has become one of the most important players on the IK Sirius team in the early phase of the season, having gone the distance in the first two rounds and being used as an impact substitute versus Norrkoping. The attacking midfielder has spent the last eight years of his career in Sweden, first representing Gimo IF before spells at IK Sirius and Jonkopings Sodra.